I'm not seeing much reference material for gloves & boots. Does anyone have information on reference material, vendors, etc. for gloves and boots? Thanks! I'm not sure how much this applies to the other pilots, but for the X-wing pilot, the gloves and boots are pretty standard. The boots used in the movies were WWII era German Jack boots. There are several variations of Jack boots that can still be found at surplus stores and most are approvable. If you do go looking for Jack boots, make sure that you understand the sizing system. Or you can just buy a modern pair of "Engineer" style motorcycle boots. The lower strap and buckle needs to be cut off to make it approvable. IMO, the motorcycle boots will be much more comfortable than Jack boots will be. Especially if you have to march in any parades. As for the gloves: There are a few sources for gloves that can be used. Pleather is also acceptable if you prefer not to use leather. That's some excellent advice david and thanks for pointing me towards that link Rich. I did get a pm and was able to purchase some great sith armor gloves. As for the boots, there's good info out there but nothing definitive. There's a picture on the x wing pilot standards page, does anyone know what kind of boots these are? Since I'm doing a skywalker costume does this require different boots from the normal xwing pilot boots? 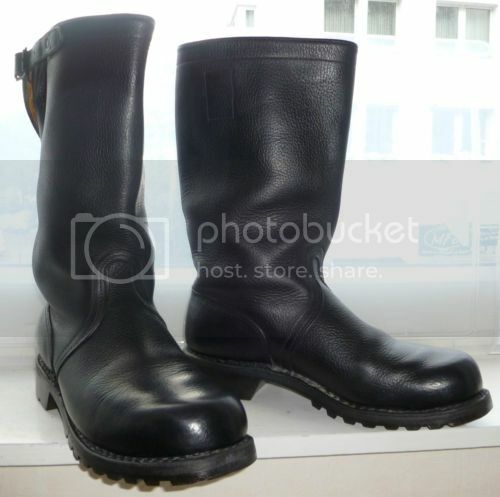 Someone suggested these biker engineer boots to me (then removing the bottom buckle). http://www.myleather.com/site/product?pid=41625&dispid2=144. Can anyone tell me (maybe costume judge) if these boots would work? Thanks! Those boots could work, but the ankle straps have to be removed and the top buckles need to be hidden. One will easily be able to be hidden under the leg flare strap, but the other will need to be bloused over by the pant leg. Skywalker uses the same boots as a normal pilot. Sometimes there's confusion there because there's the famous promo picture that has Mark wearing the wrong boots (among other inaccurate details). 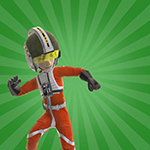 There's a picture on the x wing pilot standards page, does anyone know what kind of boots these are? Those are the standard Jack Boots. Sorry to have to nit-pick but it would be better to avoid terms like "standard jack boots". 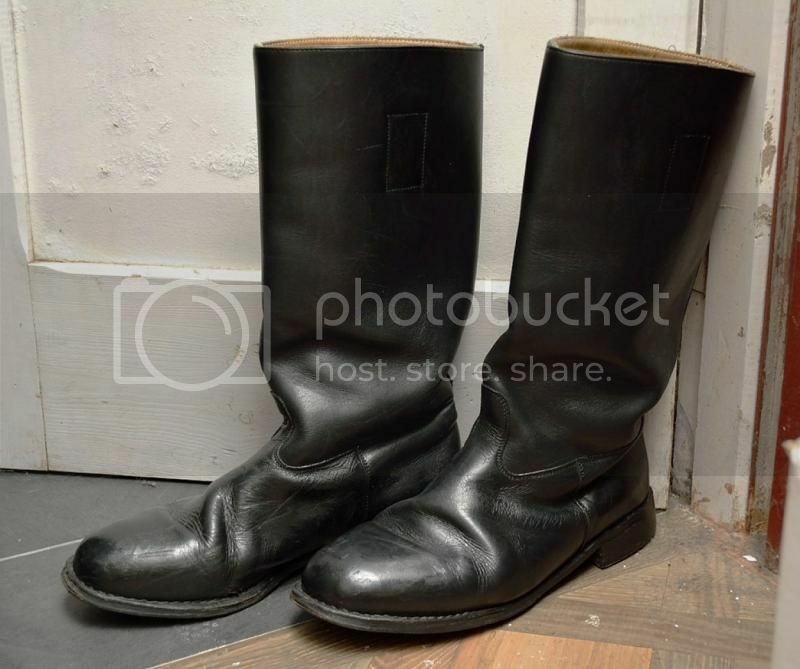 No such thing exists as "jack boot" (German _"Knobelbecher(-stiefel)) is a generic and laregly colloquial term used to describe a very broad range of boots. Your best bet for a close match for the original boots is German army surplus. Modern Federal german Army boots are still close to those used in the movies (they may or may not have been WWII Wehrmacht surplus). "Knobelbecher" is a useful seach term but also a very colloquial term which refers to a very general style of military type boot. It's the equivalent of the English term "jack boot". It may refer to any number of similarly styled boots. It is not a specific nor is it an official designation. 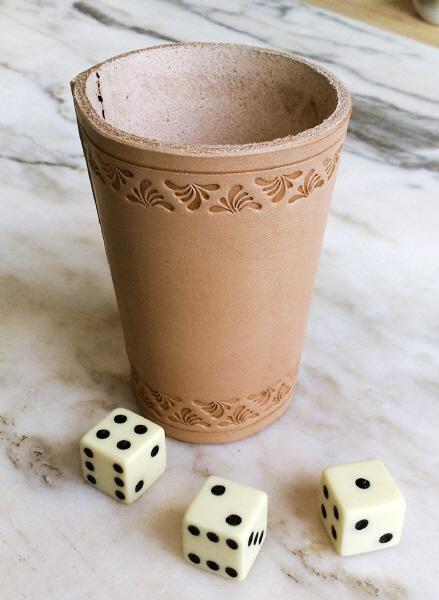 The literal translation from German is "dice cup" because this type of boot with a calf-high shaft resemble the traditional leather cups used for dice games in Germany. Yes, searching for "Knobelbecher" will bring up a number of results but it will be a very general search. At the moment, my favourite type of boot (available from modern Bundeswehr surplus) for recreating the Rebel pilot jack boot look is the "Bundeswehr Marinestiefel" and they're the next pair on my shopping list. Hi Guys, thanks for the continued discussion about these boots. Rich330 you really seem like an expert about all of this and I can tell you really know your stuff. So I'm trying to find that happy medium between what looks authentic (with modificaions, if required), comfort, and cost. Thanks again to all that have contributed to this discussion and let's keep it going if there is more information that's out there. I can understand if you wouldn't want to wear boots wornj by the Nazis but realistically I'm talking about surplus from the modern Federal German army, i.e. post war, becasue that's what's readily and abundantly available. As well as being an ally of the USA and representing a modern Western democracy, until just a few years ago they were banned from any kind of military action and the armed services were not much more than another branch of the emergency services and a training centre for young men doing military service. Hi, I'm just getting started on my pilot and have been looking for sources for boots and gloves. My question is regarding the gloves that David suggested. I thought that the gloves were required to have verticle stiching on the back of the hands. Is this something that's needed to make the gloves aproveable or does it not matter? Thanks for the help!